I have a lot of dreams that I am a contestant on American Idol...I am not kidding...A LOT. They range from me being prepared and confident to me feeling like I am going to throw up, forgetting which song I am singing, and terrified of Simon Cowell. When I wake up I always think, well that was weird. What made me dream all that? Then I remember, oh yeah, it is because anytime I sing to myself I actually think, hey this would be a great song to sing on American Idol. I am not kidding. As I work out, I belt out songs. In the car, I belt out songs. When I clean, I belt out songs. AND in my head I am on stage singing on American Idol. Go ahead, you can openly mock me. Reality always materializes, mostly when Hubby makes fun of my loud, breathless, ipod, work-out singing with a sarcastic, "you sound sweet". It is then that I realize I will never be an American Idol star. I am just out of my league with the crooners of the nation. Fortunately, I dream about another thing ALOT, this is a little more attainable, reachable, doable. I dream about crafting.I dream of new projects. I dream about sewing. If it has to do with being crafty, you name it I dream it. 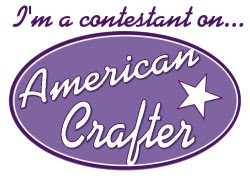 So when I heard about the Next American Crafter competition hosted by Nap Time Crafters, I knew I needed to apply. I linked up my favorite recent project and waited to see if I was going to get my "ticket to Hollywood". So this week the theme is Be Mine Valentine. So keep in touch. Send happy thoughts or chocolate my way. At the end of this week I will start my journey to be the Next American Crafter. 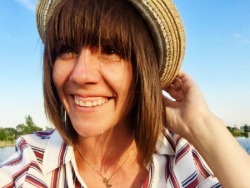 Larissa, I don't often comment on your posts but I sneak in on them a lot, and am always amazed at what you are currently up to. When I had three kids at your kids' age, it was all I could do to keep my house clean and the laundry done, let alone beautify or craft. I'm not sure what you eat for breakfast, but maybe I should start eating the same thing. Anyway, I loved this post and I am excited for you. You deserve some props for your creativity and craftiness. So I know nothing about how this contest works, but I've got my fingers and toes crossed. And no throwing up -- just CONFIDENCE! Love ya!!! !